I'll never forget the first time I had beer from Bootlegger's Brewery. I was at a friend's birthday party and she told me she had some beer from a brewery that was just up the street from her house. Of course, being at a party where the beer is free, I had to try some! I may or may not have had more than my fair share of Old World Hefeweizen. I was amazed at how flavorful the beer was and ended up liking it a lot more than my usual beer of choice. My friend told me, in between my sips of all of her beer, that Bootlegger's was a small brewery that was located in what looked like somebody's garage. I just kept thinking to myself, beer that's made in a small place like someone's garage? Thanks to Bootlegger's Brewery, I had my first taste of craft beer all those years ago. If it wasn't for Bootlegger's Brewery, I may never have found the light that is craft beer! Yesterday, I had the opportunity to attend the sixth anniversary celebration of Bootlegger's Brewery. The event was located as it has the past two years at the lovely Muckenthaler Cultural Center in Fullerton. The setting is beautiful, making you forget that you are in Orange County. 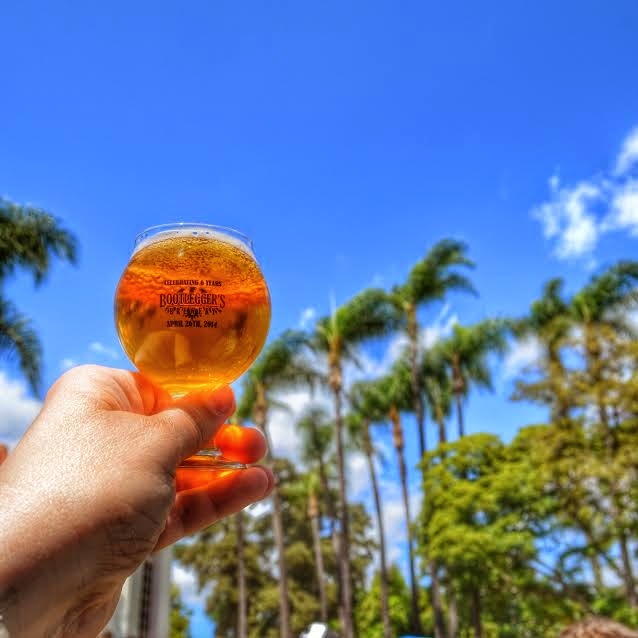 The event featured several local breweries as well as those from other parts of California and even some from out of state, like Ninkasi Brewing. Besides glorious beer, there were a great selection of food trucks, games, live music, and of course a mechanical bull. Cause, what beer event is complete without a chance to test your skills on a mechanical bull? Since the Muckenthaler occupies such a large area, jockey boxes and beer pouring stations were spread out all over the vast lawns and garden areas. Although over 1,100 tickets were sold, it never once felt crowded while mingling with fellow craft beer enthusiasts. The lines at all of the various vendors were never more than a few moments long, which of course helped the day to run smoothly. Bootlegger's brought 61 beers to share with their loyal fans. Among them were variations of their standard beers as well as beers that were only available at the anniversary. My favorite beer of the day was the 2011 Imperial Black Phoenix. I've had this beer before and it definitely keeps improving with age. Thanks to Bootlegger's Brewery for putting together another amazing event, I can't wait to see what the future has in store and to celebrate again next year! 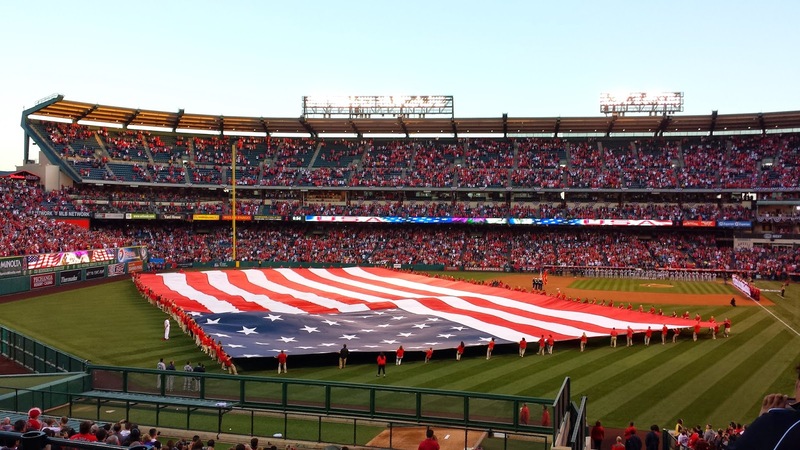 Yesterday I had the chance to visit one of my favorite places, Angel Stadium for Opening Day! Of course, I had to start off my adventure by visiting one of my favorite local breweries, Noble Ale Works. Since Opening Day coincided with an Anaheim Ducks game, it was a bit crowded. But, I never mind waiting for good, local, craft beer! I decided to have one of my favorite beers, Big Whig IPA. 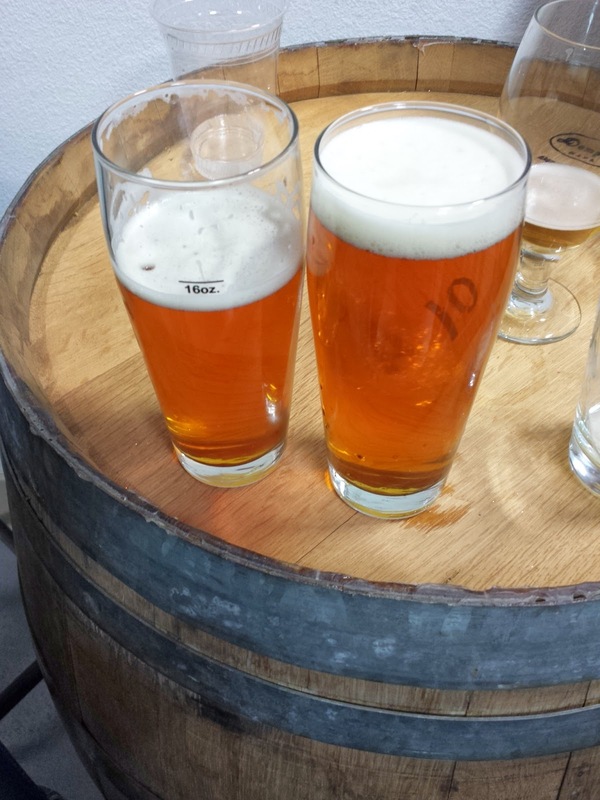 I also had a chance to sample a newer beer made by Noble, Simcoe Showers, a tasty DIPA. 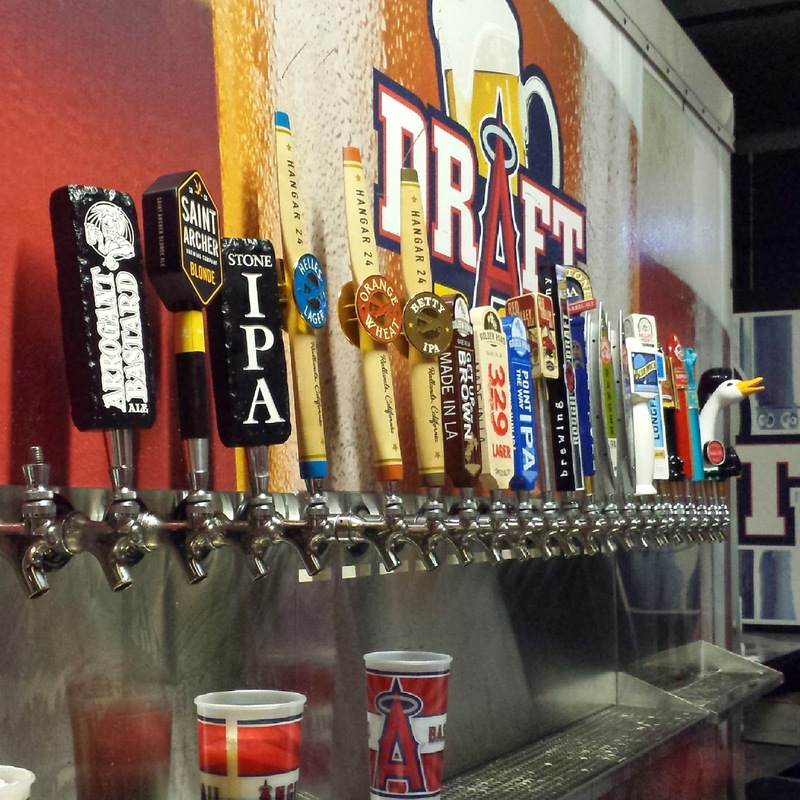 After a quick walk over to the Big A, I was eager to check out one of the craft beer stands in the stadium, Draft Pick. Draft Pick is located on the field level of the stadium on the third base side of the stadium, near Gate 2. Last year, I wrote about the craft beer options at the stadium, and was curious to see what changes had been made during the off-season. I was pleasantly surprised to see so many more options available! Last year, there were six craft beer breweries available at the stadium. This year there are now twelve! The breweries available at Draft Pick include: Stone Brewing Co, Saint Archer Brewery, Hangar 24 Brewery, Golden Road Brewing, Karl Strauss Brewing, Rough Draft Brewing Company, Firestone Walker Brewing Company, New Belgium Brewing, Ballast Point Brewing, Bootlegger's Brewery, Goose Island Brewery, and Kona Brewing Co. Even more exciting to me, is that nine of the twelve breweries are from California. The prices of the beer are pretty reasonable, $12.75 for 24 ounces of delicious craft beer. So many great beers available at Draft Pick! After grabbing some beers, next stop was one of my favorite places to view a baseball game at Angel Stadium, the left field pavilion. I love the great view this area offers! Opening Day never ceases to amaze me with all of the special events, such as the amazing U.S. flag which nearly fills the entire field. I kept looking up in the sky for a flyover, but then realized instead of a flyover, there would be people parachuting! The Navy Parachute team, the Leap Frogs arrived right before 7:00 and were awesome. 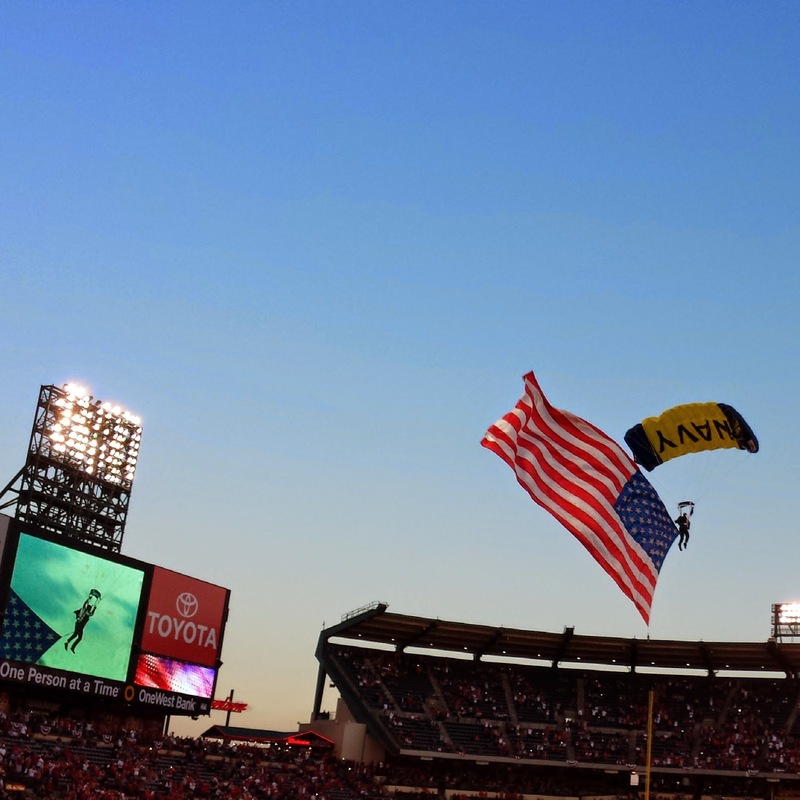 As a Navy brat, it made my heart so happy to see the Navy represented at Angel Stadium! Even though the Angels didn't win the game, I still had a fantastic time at the game. I can't wait for the rest of the season! 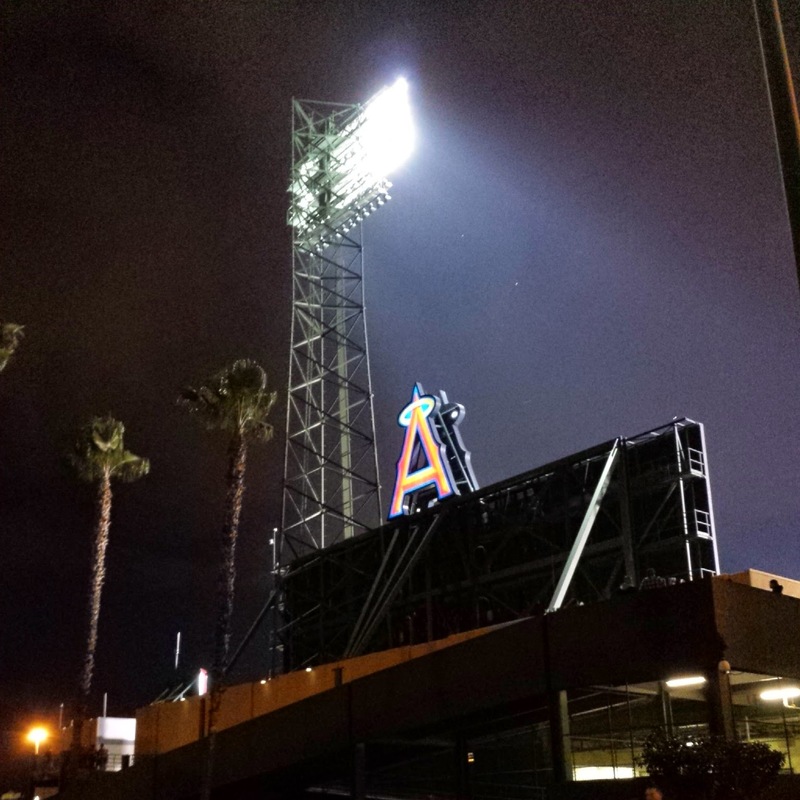 Goodnight, Big A, see you next time!